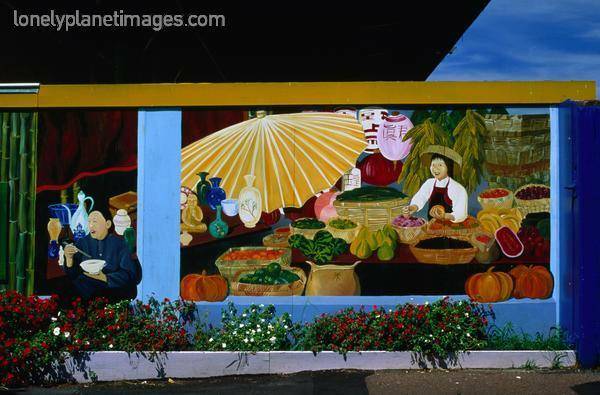 Oriental Market on Auckland's Waterfront? This picture is one of few I could find that show the Oriental Markets building in the course of demolition. I remember going to the Oriental Markets. 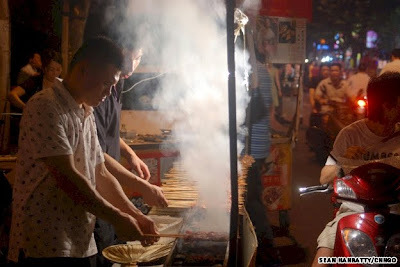 The smells, authenticity, and the great tastes that were to be had. Reminiscent of travels abroad. Auckland's oriental market traditions have, since demolition, withdrawn to the suburbs - to places like Howick, Northcote and Dominion Road. Is there a place for them on our waterfront? 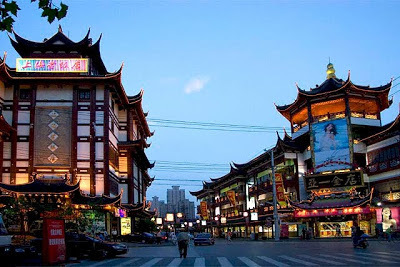 Shanghai’s waterfront is synonymous with its history. 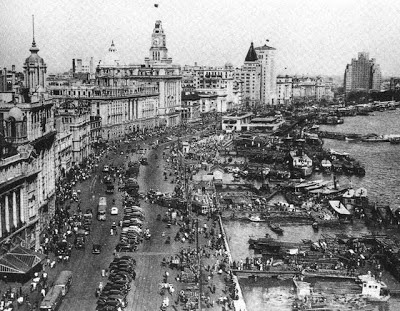 The archetypal image of Old Shanghai is a view of the city’s former front door, the storied Bund along the Huangpu River, lined with ostentatious colonial banking and commercial buildings, symbols of Shanghai’s bizarre history of foreign control and profiteering. This is how it looks today. Looking to the North West. A significant change has been the development of the waterfront promenade. 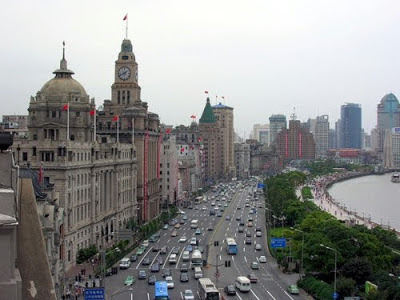 You can see my walk down to this part of the Shanghai waterfront - also known as the Bund - here. Turning round and looking South East you can see how long the Shanghai Waterfront is. Along the river. The "Bund" area of it is just a part of it. Ok. 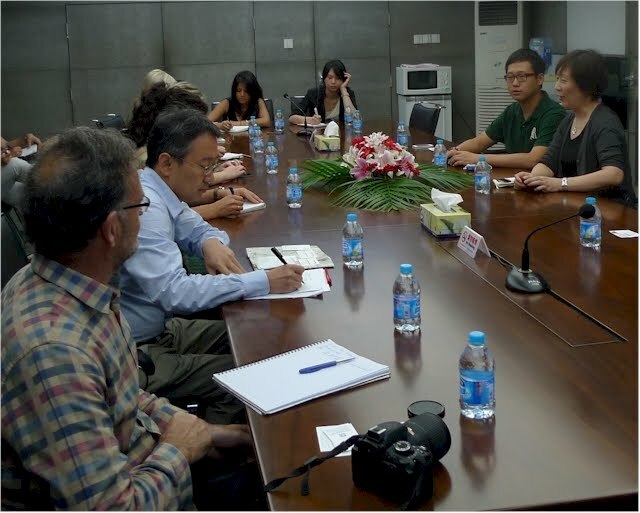 So here I am (left) with Kai Gu and students (University of Auckland), meeting with representatives of Shanghai Huaihai Group. We mainly spoke with Hesheng Wu (the woman third from right) who is its Chairperson. Established in June 1996, Shanghai Huaihai Commercial Group is a state-owned modern commercial and trade company engaged in commercial asset management, domestic trade and business investment property management. 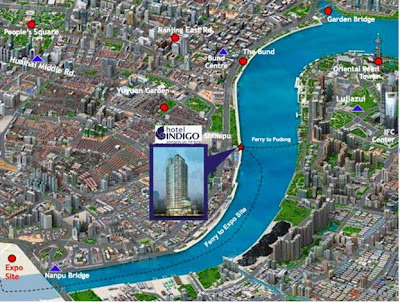 The group owns 19 wholly-owned subsidiaries and primarily oversees the premier commercial assets on Huaihai Road (Shanghai’s Ginza district). It has major responsibilities for part of waterfront redevelopment. In some ways the Huaihai Group is a bit like Auckland's Waterfront Development Agency. It is the state owned interface between private development (on the waterfront and other character parts of Shanghai), and the state. This view (it was raining hence the drops...) is North from the top of the Indigo Hotel, and shows the waterfront land between the Hotel and the Bund. 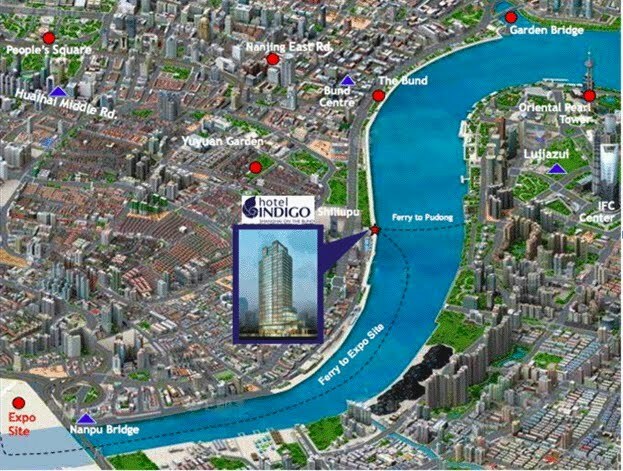 The Huaihai Group is one of the state entities responsible for its redevelopment. The redevelopment also includes land holdings to the West of the main road corridor. But my interest was mainly to understand what was proposed for the waterfront edge. As you can see, the land has been substantially developed. 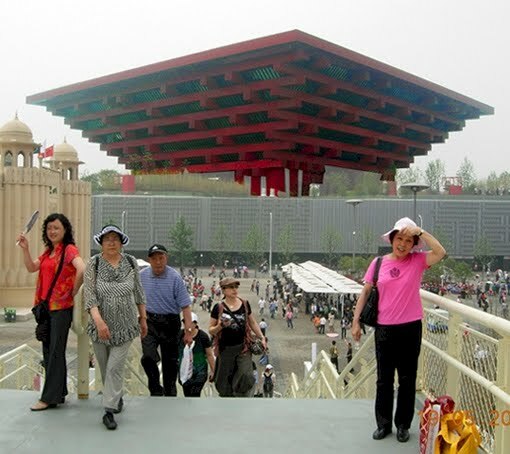 This was primarily for the Shanghai Expo which was held in 2010. (A very grand and commercial version of what Auckland did on its waterfront for the Rugby World Cup if you're looking for an analogy....). Expo 2010, officially Expo 2010 Shanghai China was held on both banks of the Huangpu River from 1 May to 31 October 2010. It was a major World Expo in the tradition of international fairs and expositions, the first since 1992. 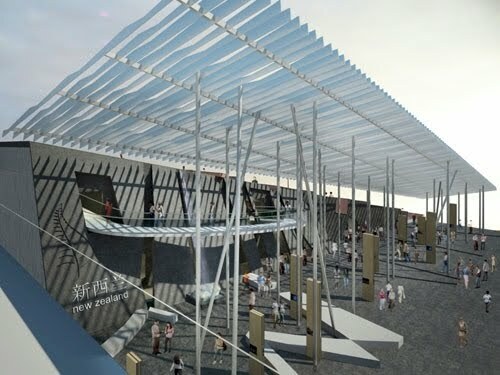 The theme of the exposition was "Better City – Better Life" and signified Shanghai's new status in the 21st century as the "next great world city". 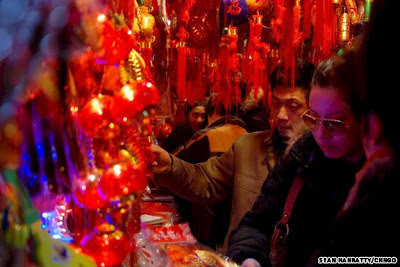 It had the largest number of countries participating and was the most expensive Expo in the history of the world's fairs. By the end of the expo, over 73 million people had visited, and 250 countries and international organizations had participated. "...Govt has recognised the value of the waterfront, especially after the Expo, and supported redevelopment..."
"...Shanghai's history is one of various foreign concessions... committed to retaining that cultural identify... part of the drama to expose diversity in CBD..."
Phase 1: Will be more highrise primarily to accommodate work. Disadvantage will be more traffic - especially at major intersections. Commitment to retain heritage frontages, and renovate interiors. Phase 2: Will be shift of some existing residential provision away from CBD, in order to make room for more parks and the highrise. This is part of big picture transition for Shanghai. Phase 3: Emphasis in establishment of creative quarter - artists, architects. 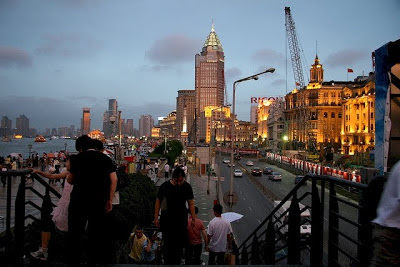 Bund is not just a place for tourists to see. 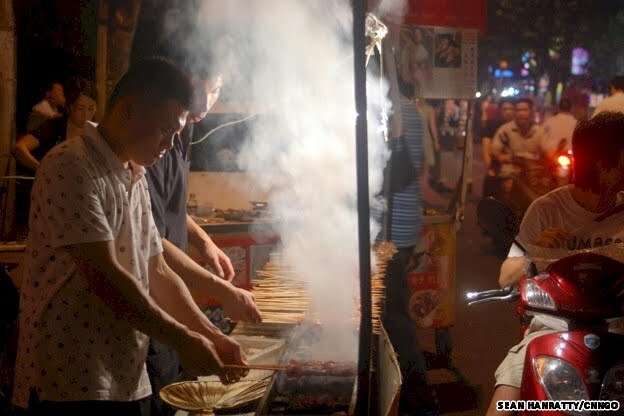 We want to establish travel festivals and restaurants - so there is more for people to do on the Bund areas. Also more leisure areas. 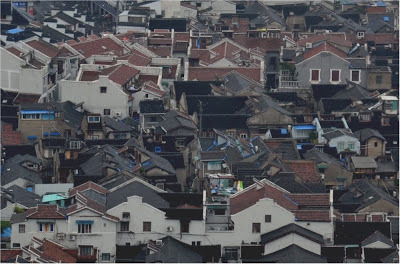 Phase 4: Older villa blocks (traditional housing) will be redeveloped. They used to be residential. being upgraded to provide art galleries, offices and restaurants. 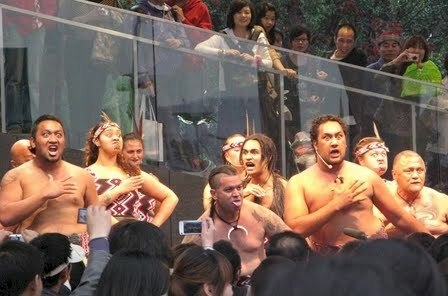 And while we're at it, we really need to plan for a distinctive Polynesian cultural presence on Auckland's waterfront. 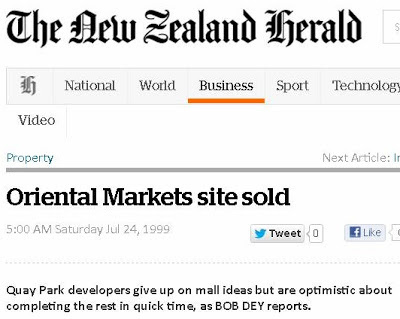 This article appeared as an edited version in NZ Herald 14 November 2012. It is of concern that while individual home owners and property investors are being encouraged to reduce debt and increase personal savings, Councils throughout New Zealand are building fiscal cliffs that put ratepayers at financial risk. An extraordinary example of this threatens Mangawhai ratepayers today. Kaipara District Council (KDC) borrowed $60,000,000 to build a large community wastewater system that would be funded by an assumed high rate of growth that would occur uninterrupted for the next thirty years. With the global financial crisis well underway KDC had ample warning to downsize the project - or even to stage it - but for reasons that still remain shrouded in secrecy, in 2009 Council decided to build the whole thing at once. As growth and development dried up Council went into panic mode to service the debt. Rates rocketed, ratepayers rebelled, and many are now engaged in a rates strike. A Government appointed Review Team reported that the debt incurred by Council to fund the Mangawhai Scheme make it “one of the most indebted councils in New Zealand”, with a debt per capita of $4,436. The report advised that there had been a “failure of governance” within Kaipara District Council and recommended that commissioners be appointed “as soon as possible”. Government has intervened, sacked the council, and appointed four commissioners to clean up the mess. An investigation by the Office of the Auditor General is expected next month. This year Auckland Council adopted its first Long Term Plan. Among other things it provides for an $800,000,000 loan so that Watercare can build the Central Interceptor sewage project. Overall Council borrowings will almost double to $8,839,775,000 in the next five years – without even providing for the proposed City Central Rail Link project – resulting in a debt per capita across Auckland of almost $6,000. In the 2017-18 year, the Auckland Council plan reveals that its cost of finance – interest in other words – will be equivalent to more than 30% of its rates revenue. The Auckland Council Plan – like the Kaipara District Council Plan – assumes a very high rate of growth. It assumes that developer levy revenues for example will increase by a factor of four over the next five years, to $221,086,000 in 2017. It also assumes that Watercare’s revenues will increase by over 35% in the same period. But what happens if that high rate of development and growth does not eventuate? It is some comfort to hear the Mayor call for rate increases at or below inflation, but the truth is that Council is funding much of its activities from borrowing, based on the presumption of sharply increased developer levy revenues from sustained high growth and property development. Savings suggested so far by Council are very much in the rats and mice category. Mowing of berms and suchlike. The global financial crisis has not gone away, though New Zealand has sheltered from its immediate effects behind a growing pile of loans. But what happened in Mangawhai is a canary in the local government coalmine. A prudent Council should not be betting on growth today. Council’s should be acting incrementally and cautiously, and not embarking on major think-big projects funded by loans. The future risk to ratepayers is too great. Sewage management and wastewater treatment is a core responsibility of local government in New Zealand. Many small communities are under pressure to switch from local onsite systems to council controlled community schemes, even though a cheap and reliable option can be the adoption of a bylaw enabling council to inspect onsite systems and require that minimum standards are met. Large centralized sewage systems are typical in New Zealand’s urban environment. These are expensive to build and - as environmental expectations increase – alarmingly expensive to maintain. North Shore City Council discovered this when community pressure obliged Council to fix its network and prevent wet weather overflows from sewer pipes which were closing local beaches. North Shore City Council investigated sewer augmentation options not unlike Watercare’s proposed Central Interceptor Tunnel, but rejected them on the basis of cost. Instead North Shore City Council adopted a dual programme to reduce stormwater infiltration into its sewer network, and to build underground storage tanks which collected the most damaging and frequent overflows. When the storm has passed and the sewer network has drained sufficiently, the collected wastewater that would otherwise have polluted beaches, can be pumped to the treatment plant. The benefits of this approach were many. It was not capital intensive and could be funded from rates revenue. It was an approach that could be staged – environmental benefits were immediate when the first overflow storage tank was constructed. It allowed for a de-centralised approach to network management – which lent itself to computer control in response to concentrated weather events. Watercare would do well to study North Shore’s experience. My assessment suggests savings of over $500,000,000 for the whole project, but it may be that through staging the project over time, the benefits might be even greater. 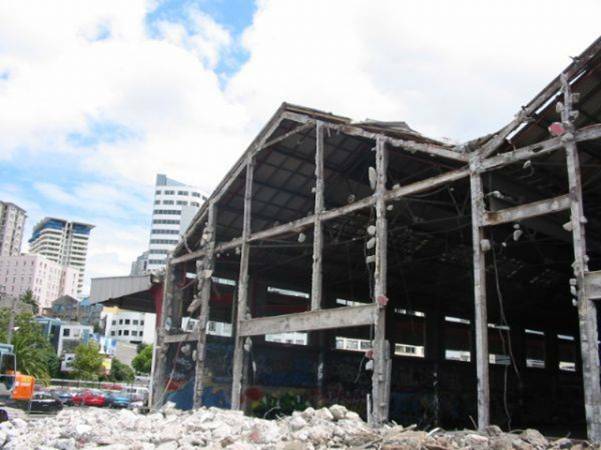 Auckland Council and Watercare need to identify new ways to do the same old jobs. And they need to operate within the community’s ability to pay – especially when their best growth assumptions turn to custard.